To rent a rental car at Funchal Madeira Airport (FNC) is ideal for exploring the Atlantic island of Madeira on your own. You can easily and conveniently find the airport car hire companies at Driveboo and book your desired rental car online. Experience the island independently and flexibly with a rental car at Funchal Airport. Which car hire companies are located at Funchal Airport? The airport car hire companies carry the latest models of vehicles to make your journey as pleasant as possible. Renowned companies, both locally and internationally, offer them a safe and reliable driving experience. Choose from a wide range of vehicles. You will find your reserved rental car right outside the terminal. With a rental car you are independent and flexible on the island of Madeira. Madeira (FNC), also known as Funchal Airport, is the international airport of the Atlantic island of Madeira, which belongs to Portugal. It is located in the east of the island directly at the city of Santa Cruz and 13.2 km northeast of the state capital Funchal, after which it is sometimes also called colloquially. It mainly handles flights to European metropolitan regions due to the importance of Madeira as a leisure destination and is crucial for air cargo to and from the Madeira archipelago. It is the fourth largest airport in Portugal.The airport has a single terminal, which was opened in 1973. The building has 40 check-in counters, 16 gates and 7 baggage carousels. There are no passenger boarding bridges, so passengers can either travel the short distance to the terminal or take the bus. The majority of the terminal is underground. The airport building was modernised and extended in 2016 to increase passenger capacity and integrate new shops and restaurants. A new bus stop shelter and three new arrival gates were built. The aerobus leaves from the airport to Formosa Beach and stops at numerous hotels along the way. The journey to the final stop Formosa Beach takes about 45 minutes. From there you can also drive to Funchal in 20 minutes. There are daily bus connections from the airport to many different destinations in Madeira. You will find the timetable at the airport and online. As an indication, a ride from the airport to Funchal costs 3,35 €. You will find cafés, international and Portuguese cuisine, an ice cream parlour, a tapas bar and a pizza hat in the airport. For shopping at the airport there are gifts, fashion and accessories, sports and football articles, travel supplies, delicacies and a duty-free shop. In case of a medical emergency, the airport has a first aid room, which is constantly staffed by a nurse. The room is equipped with modern equipment for patient monitoring and a defibrillator. For your convenience, the airport offers a range of services to take care of any short-term business, from currency exchange to international money transfers or travel insurance. Discover the benefits and enjoy a relaxing journey. In the old town hall "Santa Maria" in the eastern city center, there are many old buildings in the splendid architectural style "Emanuelism", which was typical for Portugal at that time. In the vicinity of Funchal there are spacious parks and gardens that invite you to linger. If you would like to rent a car to visit companies on your own, you should not miss the aquapark in Santa Cruz. The sea swimming pool in Porto Moniz, at the other end of the island, can be reached in less than an hour by car from the FNC. A tourist attraction is also the lava cave "Grutas e Centro do Vulcanismo" in Sao Vicente, which is 45 minutes from the airport by rental car and about 30 minutes from a pick-up station in Funchal. Madeira is a subtropical archipelago in the Atlantic Ocean and an autonomous region of Portugal. 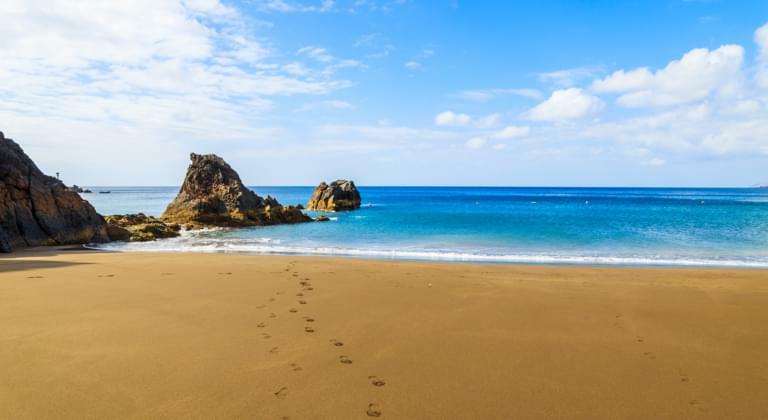 The archipelago consists of two populated islands, Madeira and Porto Santo, and two groups of uninhabited islands called Desertas and Selvagens Islands. Geographically located in Africa, it is a region on the very edge of the European Union. Known worldwide as the islands of eternal spring, Madeira, also known as "Ilha Jardim" or "Pearl of the Atlantic", has a mild climate all year round. The island of Madeira is 500 km from the African coast and 1,000 km from the European continent. 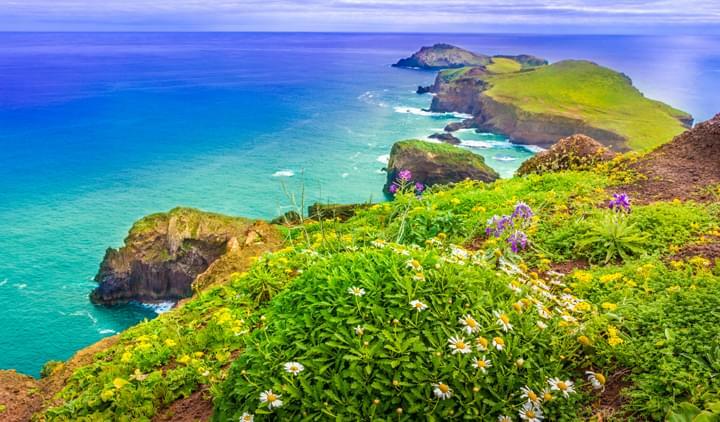 With only 1.5 hours flight time from the mainland of Portugal and about 3 hours from all major European countries, it has become a popular tourist destination all year round.